I bartend for a living, and up at The White Mountain Hotel we really pride ourselves on having an excellent drink menu using fresh ingredients and combining old and modern recipes to recreate interesting cocktails. To me, the best part about being a bartender is coming up with new cocktails and finding new liquors to experiment with, Josh has a particular flare for creating delicious cocktails. Last winter we discovered Art in the Age of Mechanical Reproduction, a distillery out of Philadelphia. At Art in the Age, liquors are recreating using ancient recipes and post-modern ideas. All liquors are made with herbs, roots, and vegetables and are certified organic. Root is based on a 1700 era "Root Tea" which was made with sarsaparilla, root bark, and other wild roots and herbs. During the temperance movement, the alcohol was removed from the tea and the new drink was deemed Root Beer. Snap is based on a traditional Pennsylvania Dutch ginger snap cookie recipe, full of molasses and ginger flavor. Rhuby takes it's inspiration from agriculturalist John Bartram's love for Rhubarb. The recipe is inspired by Bartram's original garden tea which he created to showcase Rhubarb flavors. We've tried Root and Snap and can't wait to try Rhuby. However, my inspiration for this post was the discovery of a fourth liquor, Sage! 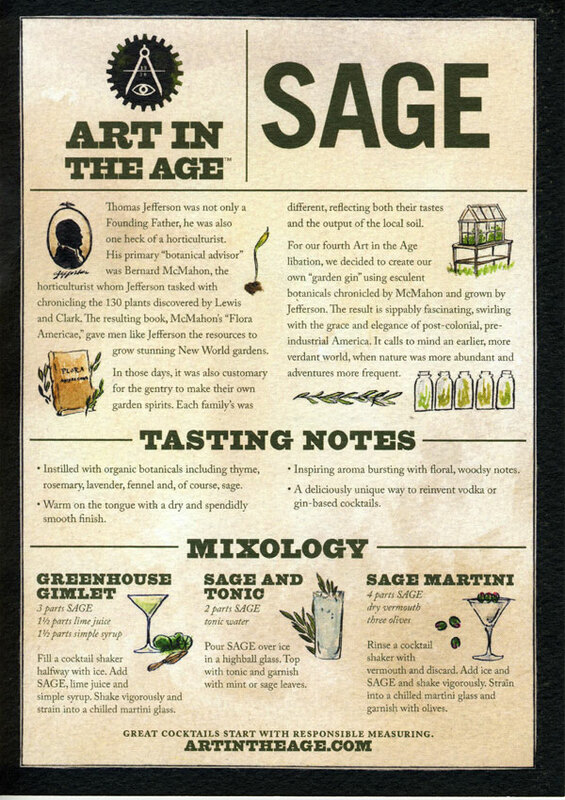 Sage is based on Thomas Jefferson's original Gin recipe. 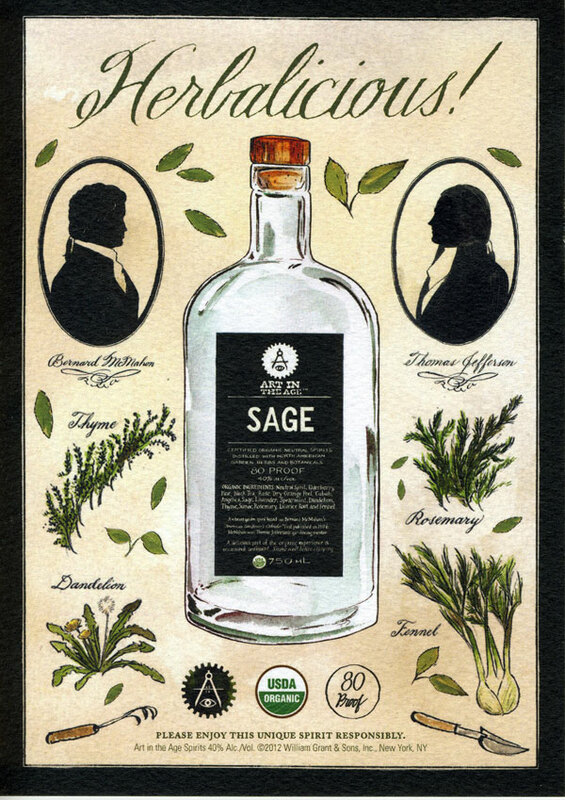 In older times, families often distilled their own liquor using botanicals and herbs from their gardens. I'm so excited to try this! You could create so many different cocktails, I'm thinking a Bee's Knees (Sage, honey, lemon juice) but even a simple sage and tonic would be delicious, especially if it was garnished with fresh herbs. When I get my hands on a bottle I'll be sure to experiment and share my concoctions. What are some of your favorite cocktails and liquors? I'm always on the lookout for something new!